From our shop in Verulam Road, we printed t-shirts for local businesses and walk in customers from 2001. We are now on-line so look no further than www.printedclothing.com for all your garment printing needs. 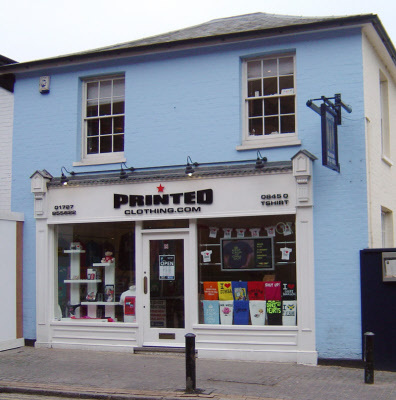 We have been supplying Tee Shirt Printing to St. Albans for nearly 20 years and offered a wide selection of products and services including t-shirt printing, screen printing, embroidery, vinyl printing, heat transfer and much more. We can supply and print school leaver hoodies, custom t-shirts, polo shirts, hoody's, sweatshirts, and most other garments in all styles and sizes from kids up to 5XL. 1. A speedy and reliable delivery service, from a local warehouse delivered to you in St. Albans. 2. A wide range of products with virtually limitless options and choices. 3. Friendly customer service, from a family run company and a group of amazing individuals. 4. We’re teamed with some of the best providers and suppliers in the country, including The Magic Touch Limited and DPD for reliable local delivery to St. Albans. We have a proven worldwide delivery provider, ensuring we stay the UK’s Local printing company by delivering fully customised and personalised garments in as little as 2-3 business days. Local business has never been so important, and we’re proud to provide many St. Albans businesses with quality printed garments, whether you’re a St. Albans brick layer, a small business looking for staff shirts based in St. Albans or one of many St. Albans clubs or societies looking for uniforms and club wear, look no further than printedclothing.com. Going on that Stag or Hen weekend in St. Albans? No sweat, we’ve got you covered with a range of fully customisable products and idea’s so dig out that embarrassing picture of your mate and we’ll do the rest.